Bb Trumpet (or Flugelhorn) and Organ version of the intimate arrangement for trumpet ensemble which was played for many years by the Disneyland Fanfare Trumpeters. 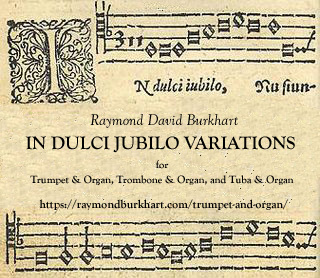 IN DULCI JUBILO VARIATIONS is based on the medieval Christmas carol, “In Dulci Jubilo.” The Latin title translates as, “in sweet rejoicing.” Popular in Germany since the Middle Ages, a 19th-century translation into English, with the title, “Good Christian Men, Rejoice,” resulted in even broader appeal. I wrote it on a whim on December 5, 2017, between the hours of 10am and 6pm and premiered it three nights later with organist David Wolfe. John Stanley’s Trumpet Voluntary is one of the finest and most interesting works from the English Baroque.